The Resource Office library has a number of multi-media resources which Presbyterian church schools are welcome to borrow free of charge. 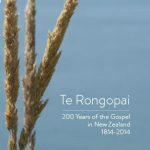 Dr Stuart Lange presents a five part series documenting the story of the gospel in New Zealand from Samuel Marsden onwards – its impact, the complications and the way Christianity has had a significant impact in shaping New Zealand society, both then and now. Running time: 65 minutes in 5 chapters. Presented by Scottish actor Philip Todd, the movie looks at the life and legacy of Scotland’s greatest Reformer, often referred to as the ‘father of Presbyterianisn. The re:Form series is produced by Sparkhouse, a division of Augsburg Fortress, the publishing house of the Evangelical Lutheran Church in America. This first in the series: re:Form, offers a programme of 40 lessons which look at questions about the Bible, creed, disciples, Jesus, other beliefs and ‘hot topics’. Each topic comes with a brief (4-6 minutes) animated DVD. There is a teachers guide and a student work (called the Anti-workbook). re:form Ancestors is a youth Bible study that explores the ancestors of our faith by exposing the real, unpolished and unexpected personalities of Old and New Testament Bible characters. With re:form Ancestors, youth discover similarities between themselves and the many unlikely people selected by God to do extraordinary things. There are 15 stories told from each Testament and the resource also comes with a Teacher’s Guide. 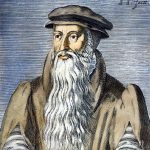 re:form Traditions Reformed is a four-unit curriculum which gives a useful overview of the history, beliefs, and practices of the Reformed tradition. This sample video is from the curriculum. Bonhoeffer, Agent of Grace DVD. A movie which portrays the life and thought of Dietrich Bonhoeffer, German Lutheran minister and theologian. Bonhoeffer believed that his Christian faith called him to actively oppose Hitler and the Nazi regime. He was executed for his involvement in the German resistance movement a month before the end of World War Two. 90 minutes long. Mother Teresa of Calcutta. 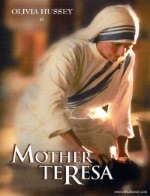 A movie which traces the life of Mother Teresa as she follows her Christian calling to help the poor, sick and vulnerable on the streets of Calcutta, India. 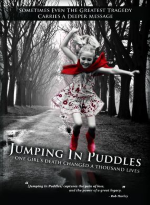 Jumping in Puddles: One girl’s death changed a thousand lives. Natasha Bray was drowned along with six others from Elim College in a flash flood on the Mangatepopo River in 2008. This 24 minute movie tells the story of the tragedy and pays tribute to Natasha’s life and her unique approach to it. ‘Jumping in Puddles’ was a phrase Natasha used to face difficult circumstances with courage and a positive, adventurous attitude. Baraka. An extraordinary movie described as ‘a transcendent global tour that explores the sights and sounds of the human condition…the wonders of a world without words, viewed through [humanity] and nature’s own prisms of symmetry, savagery, chaos and harmony.’ 97 minutes long. 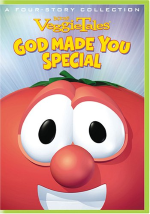 Veggie Tales: God made you special Four animated stories for pre-school and young primary aged children. 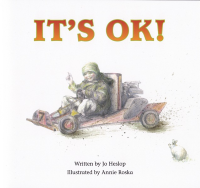 The stories aim to ‘help kids learn that they are special just the way God made them’. Four stories are on the DVD: Dave and the Giant Pickle, The Gourds Must be Crazy, A Snoodles Tale and Bob’s Vacation. Each story is 15-20 minutes long. 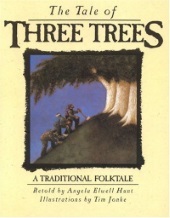 A traditional folktale which tells the story of three trees on a hillside, each with their own dream, which comes to being in a surprising way. It is a story which could be used for Christmas, Easter…or any other time! 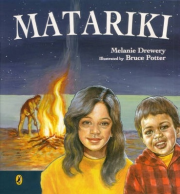 This version is by Angela Elwell Hunt with illustrations by Tim Jonke. The Resource Office also has another version of the story by Elena Pasquali with illustrations by Sophie Windham. 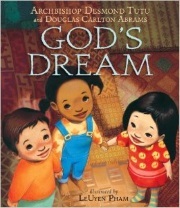 Written by Archbishop Desmond Tutu this book explores the dreams we have and the dream God has of people showing acceptance, forgiveness and love toward one another. A printable discussion and suggested activity sheet on the book can be found here.